Q: What percent of your refractive surgery patients report unresolved complications six months after surgery? This includes objective and subjective complications such as halos, starbursts, dry eye, etc. A: LASIK is considered “the safest surgery in the world,” when performed correctly according to other surgeons. At Dello Russo Laser Vision we eliminate any complications by thoroughly screening all of the candidates to evaluate good candidates for LASIK. One of the secrets of successful laser surgery is for a surgeon not to operate on anyone who is not a good candidate. In addition to LASIK being the safest laser surgery, we also use the most advanced tools, the all-laser or no-blade LASIK. 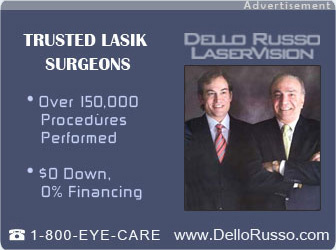 Not many surgeons around the world has Dr. Joseph Dello Russo’s experience, since he bought the very first laser in the world, spent six years testing the first laser for the FDA and spent years teaching other surgeons how to do LASIK. Some are the very same surgeons who are now offering older surgery in this region.